Back to Pennsylvania I find myself for beer #356. I have already had 52 (53 if you include tonights) beers from Pennsylvania in this 365, the most from any state. 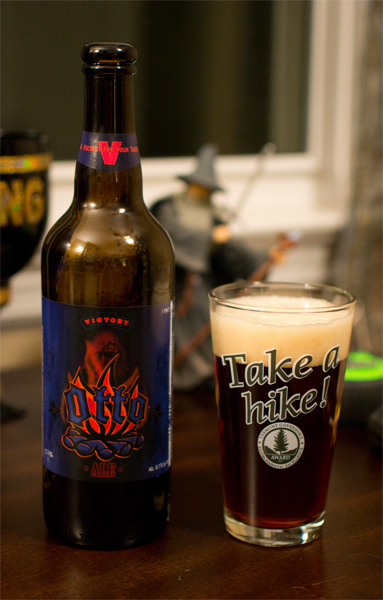 Otto Ale is my beer of choice for tonight brewed by Victory Brewing Company from Downingtown. This is classified as a Smoked Beer and has an ABV of 8.1% Interesting to note here is this Belgian Dubbel styled Smoked Beer was created based on the experiences Bill Covaleski and Ron Barchet (co-founders of Victory Brewing Company) had on their trip to Bamberg, Germany in 1987. Into my new glass, a Long Trail Brewing Company glass that the fine folks at Oak Tree Wine & Spirits (http://www.oaktreebuyrite.com/) gave to me after my purchase there today, went this dark amber brew with a very nice sized thick tan colored head. The nose was smoky (think camp fire), malty and a bit fruity with raisins and I thought I got a whiff of some grapes. It started off with a slightly sweet caramel malt flavor that melted off into a lightly smoky flavor similar to Liquid Smoke (if you cooked with this…you know what I mean). There was a bit of brown sugar here too. The fruits I picked up on in the nose didn’t really translate in the taste. It had a medium body and some very fine light carbonation that made this creamy. The alcohol was hidden very nicely here. This was an interesting beer. I really didn’t get the Belgian Dubbel aspect of this but I do find myself really enjoying the smokiness found in this style. If you dig Smoked Beers or Rauchbiers, give this one a shot. Cheers again to Oak Tree Wine & Spirits in South Plainfield, New Jersey as they were my go to beer store for the majority of this 365. I will be visiting them in the future as their selection of beers is really unmatched where I live. Team that up with a very knowledgeable and friendly staff and the little things like a free Long Trail & Sly Fox glass that will make them my go to beer store for many years to come. When I think of New Zealand, I think of the great locations they used to film the Lord Of The Rings movies. I also think of Flight Of The Conchords, a very funny show that used to be on HBO. The main characters, Bret and Jemaine are from New Zealand. So when I saw my local beer store had a brew from New Zealand, I knew I just had to try it. I knew it was business time (Flight Of The Conchords reference)! 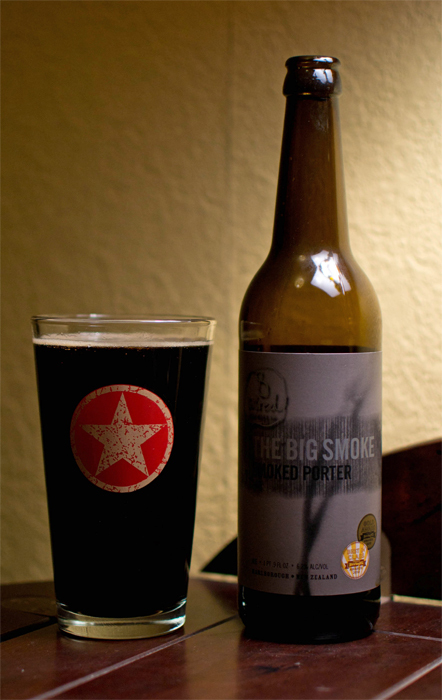 Beer #117 is that beer and it is named The Big Smoke. It is brewed by 8 Wired Brewing Company hailing from New Zealand in the style of a Smoked Beer. The ABV of this is 6.2%. Black was the color, nonexistent was the head. The nose consisted of chocolate malts with a hint of smoke. I have to be honest, on smell alone my mouth was watering. The taste was strong roasted coffee and dark bitter chocolate with a really nice smokiness going on. The smokiness followed through in the aftertaste along with a nice chocolate flavor. It had a body that wasn’t light or medium but somewhere in between. It was nice and smooth with some moderate carbonation. Super drinkable to me, I could enjoy this all night long. I wish I had another bomber or three on hand. It seems like it has been a long time since I have had a Kingly brew but I’m happy to say this beer was one indeed. This was a fantastic beer and a great way to finish off the week. The only thing that held it back slightly for me was that I wish it had a heavier smoky presence. Still, you can’t go wrong with this porter… it was absolutely delicious and a beer I think Bret and Jemaine of the Conchords would be proud of. Murray would also approve. Happy Groundhog Day everyone! Cheers to Punxsutawney Phil for NOT seeing his shadow. That means spring is only 6 weeks away! You better be right Phil. After all of the ice we had today, spring can’t get here soon enough. Today was also a nice flash back to the 80’s with the Scorpions cranking in my headphones and car speakers all day long. I dare any true lover of 80’s heavy metal to try not to want to bang your head, air guitar and flash the devil horns while listening to Can’t Live Without You (from Blackout by the Scorpions) followed up by Rock You Like A Hurricane (from Love At First Sting by the Scorpions). Crank it up…louder than hell! 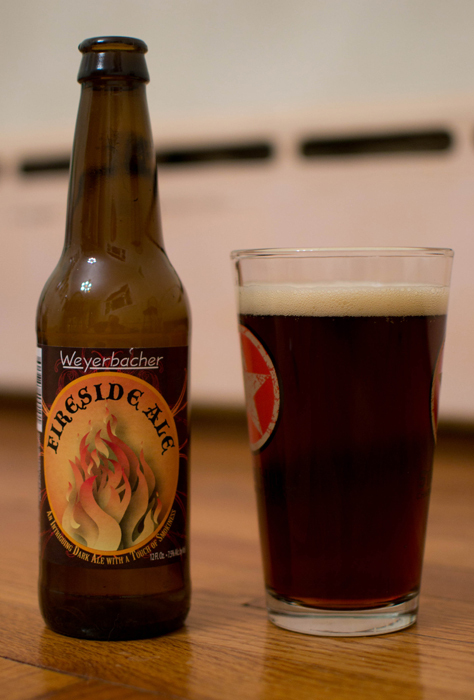 Beer #66 is Fireside Ale by Weyerbacher Brewing Company from Easton, PA. A Smoked Beer with an ABV of 7.5% sounds just like what Punxsutawney Phil might drink on a day like today, all curled up in his stump on Gobbler’s Knob. Gobbler’s Knob…really? That name just makes me laugh…you? Fireside Ale had a nice clear dark brown color. The head was about a finger width in size. The nose was on the mild side, with a bit of smoke and some toasted malts. The taste up front was bread like from the malts. The smokiness came out much more in the taste near the end of the sip but was rather subdued. There was an aftertaste that hung around that wasn’t all that pleasant that I couldn’t identify. It had a decent mouthfeel with a medium body and quite a bit of carbonation. This was fairly easy to drink and the alcohol was hidden well. I thought it was a very average beer. Nothing really stood out, even the smoke aromas and flavor were very subdued. Would I try this again? Possibly…maybe I will have to visit Weyerbacher in Easton, PA one of these days and see what it is like nice and fresh.